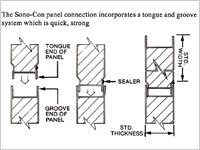 PHOENIX-E SonoCon Septum Panels are used to construct sound attenuating enclosures and noise barriers under conditions demanding both substantial noise reduction and structural characteristics. The SonoCon Septum panels are particularly effective at reducing the noise levels at those frequencies which interfere with intelligible speech. Although SonoCon Septum Panels are only 4" (100 mm) thick, each act as an efficient load bearing column or beam able to support both its own weight as well as the loading imposed by many building codes. This is accomplished with little or no additional structural support steel. 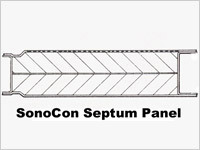 All SonoCon Septum Panel components are noncombustible, non-hygroscopic, and non-toxic. SonoCon Septum Panels are corrosion resistant, moisture resistant, and can be furnished with impermeable acoustical fill protection to guard against oil and vapor contamination. PHOENIX-E SonoCon Septum Panels are manufactured of durable 18 gauge (1.3 mm) galvanized solid steel outer shell and a 20 gauge (1mm) steel inner sheet. 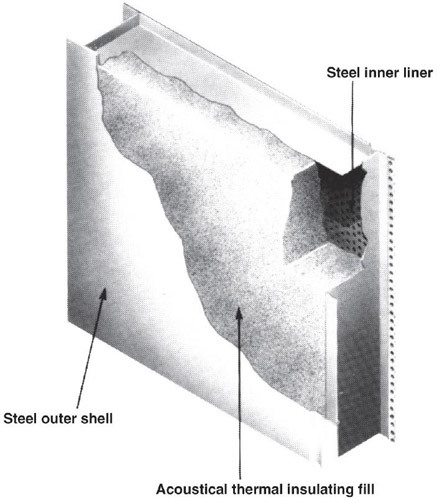 A galvanized solid steel septum sheet is imbedded within the panel's acoustical core and protected on each side with 2" (50 mm) fibrous insulation; this improves the effectiveness or transmission loss of the panel. To help eliminate reverberant noise, the enclosure or barrier is designed with the acoustically soft or perforated side of the panel placed facing the noise source. SonoCon Septum Panels provide acoustical privacy. Most information contained in speech is normally within the range of 200Hz to 6000Hz. 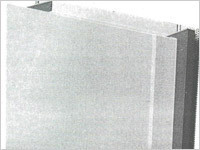 The SonoCon Septum Panel is designed to reduce excessive background noise at these frequencies enabling better communication techniques and listener comprehension. General :- Furnish and install prefabricated acoustical panels as shown on the plans. Panels shall have all specified acoustical, thermal, fire safety, structural properties. The acoustical materials shall be as manufactured and supplied by PHOENIX-E or approved equal. The acoustical structure shall be furnished complete to include acoustical panels, hardware, doors, structural support systems, mechanical, fire detection and suppression, and electrical equipment necessary for a complete and operational system. Construction :- Panels shall be 4" (100 mm) thick fabricated with 18 gauge (1.3 mm) galvanized solid steel outer sheet and 20 gauge (1 mm) steel inner sheet both formed with 180 degree returned edges to provide for secure clamping of the side channels. All steel shall conform to ASTM A-446. 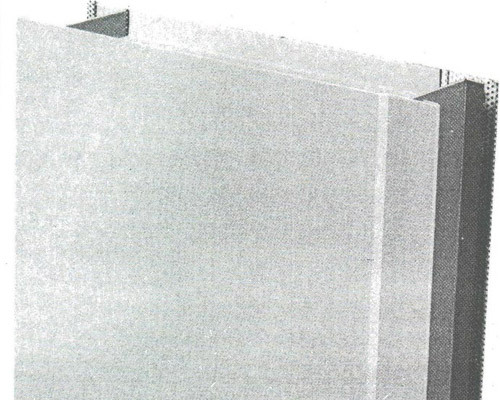 A galvanized solid steel septum sheet shall be installed inside the panel such that it is placed between two opposing layers of acoustical fill. 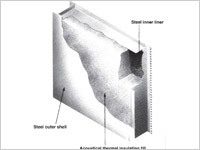 Panel face and back sheets shall be welded and/or riveted to form a rugged metal sheathed acoustical panel. Panels shall be packed with an acoustical and thermal mineral wool or glass fiber insulating blankets. No voids inside the panel will be permitted. Panel assembly shall maintain the fill materials in place under conditions of shipping, installation, and operation of the assembly. Fill materials will be inert, mildew resistant, non-hygroscopic and vermin proof. All steel panel component surfaces are to be fabricated of zinc coated steel with a hot dipped galvanized coating resulting in a G-90 coating class as determined by ASTM A-525. 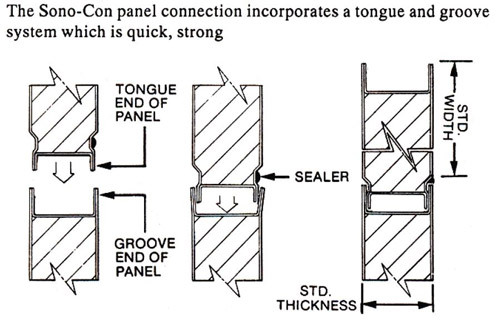 Panels shall be of SonoCon standard tongue and groove connection. Connections requiring locking devices such as wire cables or H-sections will not be permitted. Acoustical fill protection membrane, when provided, shall have no hazardous components as defined by 29 CFR 1910.1200. No material shall have concentration greater than 0.1% of any material which is classified as a carcinogen by IARC, NTP, or OSHA. Materials shall withstand a minimum service temperature of 200°C. Acoustical Performance :- The acoustical enclosure or acoustical barrier shall be constructed of panels providing the transmission loss and sound absorption properties specified. Bidders shall provide with their proposal : Copies of independent acoustical laboratory panel test data from a laboratory (certified under NVLAP) demonstrating conformance with the specification. Bids not including such reports will be considered non responsive. Panel types and locations are shown on the drawings. Fire Safety :- All panel components shall have a Class A flame spread; the flame spread rating shall not exceed 25 and shall show no evidence of continued progressive combustion. Acoustical fill shall have a smoked developed rating not to exceed 50. Thermal :- The panels shall have a thermal resistance rating of U=0.07 calculated in accordance with standard ASHRE procedures and guidelines. Drawing & Installation :- The panel manufacturer shall furnish complete, coordinated erection drawings and calculations to include, but not limited to, those pertaining to the structural support, the acoustical enclosure assembly, mechanical equipment installation, and electrical service complete as necessary for approval, building permits, and installation.